Abstract: Objective To investigate the characteristics of endometrial receptivity in patients with repeated implantation failure (RIF) using color Doppler ultrasound.Methods Between June 2014 and November 2016, 40 RIF patients and 104 infertility patients who become pregnant with in vitro fertilization-embryo transfer technology in the Reproductive Medicine Center of No. 202 Hospital of PLA were analyzed retrospectively. All patients underwent frozen embryo transfer. Parameters related to endometrial receptivity were examined with transvaginal Doppler on the embryo transfer day and differences between the two groups were compared.Results Resistance index (RI) values in the uterine artery and uterine spiral artery were higher in RIF patients than in pregnant patients, but body mass index was lower. There were statistically significant differences between the two groups (P < 0.05). 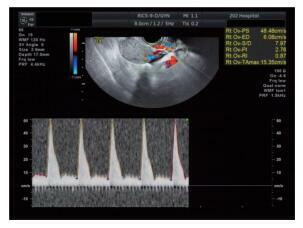 However, no difference was found in endometrial thickness, uterine artery pulsatility index (PI), uterine spiral artery PI, systolic/diastolic ratio, or uterine peristalsis between the two groups (P > 0.05).Conclusion Measurements of RI in the uterine artery and uterine spiral artery are useful in evaluation of endometrial receptivity. Uterine artery and descending endometrial receptivity may have a positive correlation in patients with recurrent implantation failure following in vitro fertilization-embryo transfer. CHENG F, LI T, WANG QL, et al. 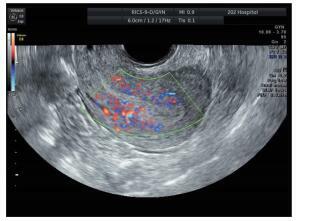 Effects of hydrosalpinx on ultrasonographic parameters for endometrial receptivity during the window of implantation measured by power color Doppler ultrasound[J]. Int J Clin Exp Med, 2015, 8(4): 6103-6108.